Dr. Graham graduated in medicine from Queen’s University and did post-graduate training in Internal Medicine at McGill University and in Cardiology at Stanford University in California. 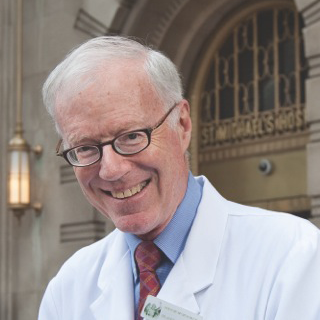 He was chief of the Cardiology Division at the Wellesley Central Hospital prior to coming to St. Michael’s Hospital in 1998. He is currently the medical director of the Robert McRae Heart Health Unit at St. Michael’s and is a clinical cardiologist with interest in cardiac rehabilitation and quality improvement. He has a particular interest in developing systems to ensure highest value patient-centered and team-based ambulatory care. Dr. Graham is also a professor of Medicine at the University of Toronto. He also is the Medical Director of Philanthropy for the St. Michael’s Hospital Foundation. He has been a longstanding leadership volunteer with the Heart and Stroke Foundation. He received the Order of Canada for his work with the Heart and Stroke Foundation and particularly for developing pre-hospital cardiac care services including CPR training for the public in Canada.